Welcome to our gallery! Here we display some of the photos received on the theme of pilgrimage and visiting cathedrals. Click on an image to find out more and view a larger version. 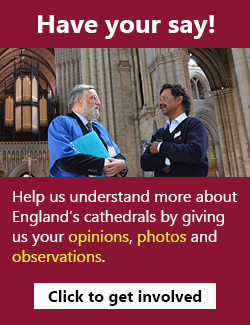 You can also upload your own images on the theme of pilgrimage and visiting cathedrals using the button below. Upload your photos to the gallery! The Cathedral lighting up the darkness. In the beginning was the word... And the word was passed across continents in the form of books. The West end of Rochester Cathedral. Canterbury Cathedral in the snow. A January day. Canterbury Cathedral - East end in the snow. My home town. Lama Sabachthani Crucifix at Durham Cathedral. I find this sculpture by Kirill Sokolov very moving. This is the tomb of Richard III at Leicester Cathedral. Remember St William of York and all pilgrims. The tomb of St William in the Crypt of York Minster.